1 How to activate Airtel BD 22GB 333TK Internet Offer? Airtel 333 TK 22GB Internet with 45Days Validity Offer! Hello Dear, Welcome to Airtel 22GB 333 TK Offer Activation Code, Validity, Uses Terms and Conditions Content. 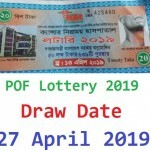 The Bangladeshi users friendly telecommunication company “Airtel BD” lunches a super big internet offer for their valuable internet users, whose name is Airtel 22GB 333TK Offer. Under this offer, customers get 22GB high speed internet for 45 days validity and maximum 500 MB internet (500MB X 45Days = 22GB Internet) per day at only 333 TK. We hope, this is a very big internet offer in cheap price. So, who customers need every day under 500 MB Data, this offer perfect for them. If you are an Airtel customers and want to activate the Airtel 22GB 45 Days Validity 333Taka offer? If your answer is yes, this is the right place for you. Because, in this content we will try to write full description about Airtel 45 Days Validity Internet Offer – 22GB @ 333 TK. So, staying with us and follow the below content. How to activate Airtel BD 22GB 333TK Internet Offer? There are two ways to activate the Airtel 22 GB 333 Taka Offer. To activate Airtel 22GB with validity 45 days 333TK Offer, customers need to recharge exact 333 TK or Dial USSD code *212*333#. After recharge or dialing USSD code, you will received offer activation message, where you know more details information about this offer. 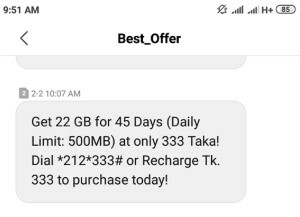 The validity of Airtel 22GB 333 Taka offer, 45 days. To check the remaining balance of Airtel 22GB Offer 2019, customers need to Dial USSD code *8444*88#. Customers use this Airtel 22GB Internet under the 2G/3G/4G area networks and uses times 24 hours. All Airtel BD customers can activate this offer as many times as they want during the offer period. Customers use maximum 500MB internet in a day. Thanks for staying with us a long time and visiting Airtel 22GB Internet 333 TK Offer Activation Code, Validity, Uses Terms and Conditions content. If you have any question about Airtel 22GB@333TK Offer? Just comment here, we reply as soon as possible.